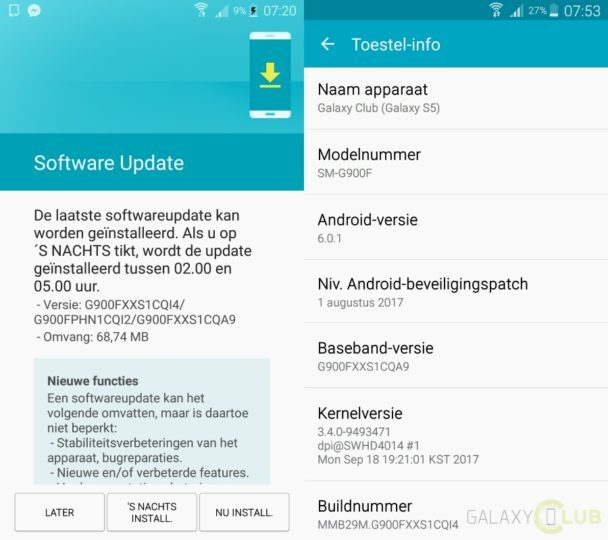 Samsung has released a new update for the Galaxy S5 (SM-G900F) in the Netherlands. The update, which has a file size of 69MB, has been rolled out through OTA. Most consumers might think that it includes the latest Android security patch, but it doesn’t. The latest Galaxy S5 update has firmware version G900FXXS1CQI4, contains usual bug fixes, optimizations, and stability improvements. However, it misses out on the September 2017 Android security patch. A similar thing happened with the Galaxy Note 8 and some Galaxy S6 variants. These smartphones have received a new update this month with a build date of September 2017 but with August 2017 security patch. The update might start rolling out in other markets soon. It is unclear to us as to why Samsung hasn’t started rolling out the September 2017 Android security patch yet. We will let you know as soon as we get more information on this matter. Funny is the SM-G900F is still receiving patches while the rest have not received anything since May. But this news is already indicative that the SM-G900F can stop there too. But this release, on the s5, S6, S7, S8 and Tab S2, shows an I with August Security Patch. Very strange. Good. Phones this old don’t deserve the most up to date security patch before the flagships. All phones need latest security patch. Don’t be mean to old devices..